The sprawling campus of DAV International School reverberated with the pious sounds of Vedic hymns as the school celebrated the completion of its 20 years of foundation on November 30, 2018 in a grand function titled “Upasana Parv. The Principal of the school Dr. Anjana Gupta accorded a floral welcome to all the distinguished guests who graced this mega event with their benign presence. They included the three most important pillars of the school’s edifice – its Chairman Dr. V.P. Lakhanpal, Regional Officer Dr. (Mrs.) Neelam Kamra and Manager Dr. Rajesh Kumar. The programme commenced with the sacred Hawan Yajna Ceremony conducted in 21 Hawan Kunds. Conducted by the students of the school, this ceremony was also attended by the parents of the students . A soulful ambience was created all around on the school premises. On this momentous occasion, the students of the school gave some melodious presentations like-Shabad Gayan , Bhajan and recitation of Sanskrit Shlokas. The President of Arya Samaj Lachhmansar Sh. Inderpal Arya and Mrs. Nirmal Gupta also presented some mellifluous Vedic Bhajans. Addressing the present gathering Principal Dr. Anjana Gupta expressed her elation at this extraordinarily special moment of the school. Full of gratitude for the Almighty and the pioneers of DAV CMC, New Delhi she remarked that with the student strength of 5450 the school is progressing by leaps & bounds and creating a niche for itself in the society by excelling in curricular as well as co-curricular fields. The school has indeed added many feathers in its cap in the past 20 years by winning prestigious awards like – British Council International School Award ( 2006-2009) & 2010-2013), Mahatma Hans Raj Award, CBSE Sports Promotion Award, CBSE National School Sanitation Award, Green School Award (2013 & 2016), Swachh Vidyalaya Puraskar, Brainfeed School Excellence Award, Digital Learning Award and many more. Highlighting the scientific significance of the Hawan Yajna ceremony, the Chairman of the school Dr.V.P. Lakhanpal remarked in his address that performing Hawan Yajnas purifies our head & heart thereby resulting in a healthy body and peace of mind. Being associated with the school since its inception in 1998, he further highlighted his special attachment with the school and also expressed his happiness at its remarkable success in the las.t 20 years. Regional Officer Dr. (Mrs.) Neelam Kamra congratulated Principal Anjana Gupta on this occasion and remarked that DAV International holds a special position amongst all the other DAV Institutions nationwide. She expressed her sense of pride in being associated with such a progressive school. Manager Dr.Rajesh Kumar was overwhelmed at this special occasion of the school and showered his blessings on the whole school fraternity for many more fruitful and eventful years ahead. On this occasion, the girl students of Nav- Prerna, a service unit of the school run by Dr. V.P. Lakhanpal, were given sewing machines. The school Student Council Member- Bhavnoor Gill, a Class XII student, delivered a vote of thanks. In the end, all the eminent guests Dr. V.P. Lakhanpal, Dr. (Mrs.) Neelam Kamra, Dr. Rajesh Kumar, Mrs. Nirmal Gupta, Mrs. & Mr. Inderpal Arya , Principal Rajiv Bharti, Dr. Nikita Kahlon, S. Satnam Singh, Sh. Arun Khanna, Parents & Press Reporters were honoured with mementoes. 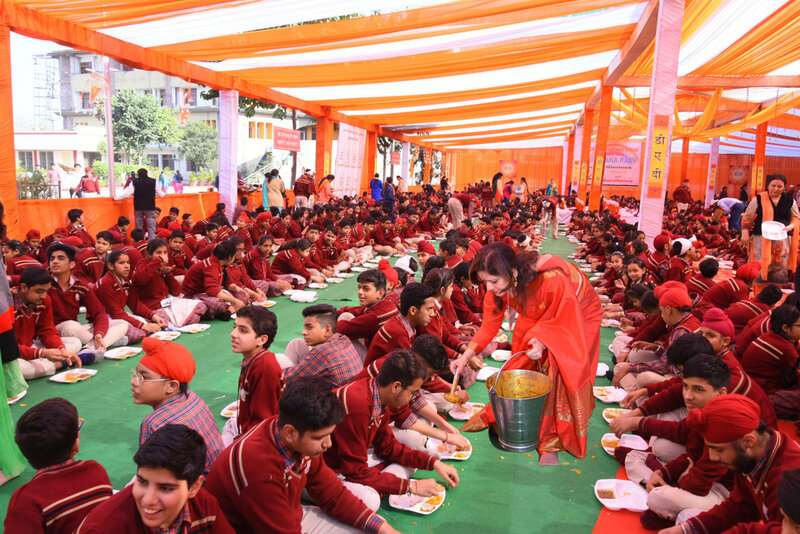 The function concluded with the chanting of Shanti Paath followed by the holy Rishi Langar.